Every holiday is spent around my dad's table. And there is several things you can count on. 2) Arguments - It wouldn't be a holiday if my brother, dad and hubby didn't get into an argument about what sports team is doing best! Sometimes they get mad at my sister and I because we debate which player has the cutest bum instead. 3) Food - Well duh what is a family dinner without food. Our is always marked with a few special items. I bring the dessert, I don't want to brag, but I make one heck of a New-York Cheesecake. My sister brings 2 sides, my parents make the main course (normally a ham) and my mom also makes some type of bread or roll. Now when I say make I mean she buys them premade. We are all still a little scared from the year she attempted to make it from scratch. That poor oven never seen it coming! 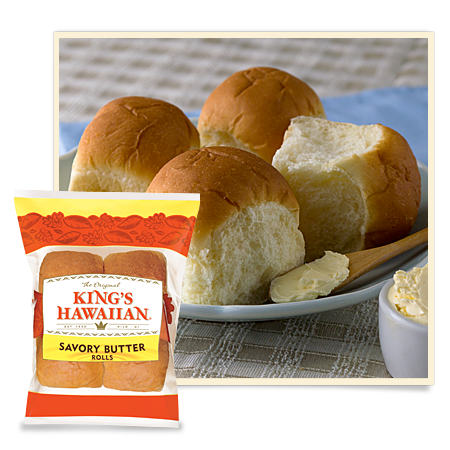 It doesn't matter though because thanks to King's Hawaiian our bread and rolls taste just as good as homemade! They offer bread, rolls and buns. Everything you could need to complete your family dinner.